Some of you probably already know that I have a large cabinet full of projects in progress. Let’s just say I probably have more in progress than most people would be comfortable with but it works for me. I am struggling at the moment to really focus on big project so each day I do the work part of the day then grab whichever project I feel like. Seems that I focus on one for 3 or 4 days then hop to another. No none of the projects will be done quickly, but at least they are all progressing. This is the last 2 days’ work. 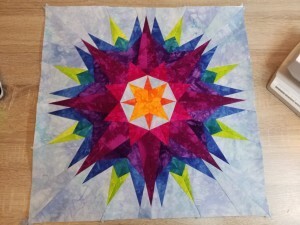 One large block from a kit. It was supposed to be a block of the month, but well it has taken a bit longer. It was one of my van projects and with no van it went on hold. I hope to get a couple of the little blocks done before I move on again. Gravity now has all its crystals on. It was more than I thought but I think it is still pretty subtle. I won’t know for sure until I see it hanging. I now have a binding that needs finishing. Joy. On the other hand the last of my all machine sewn bidnings got finished today as I am well on the way to having a stash of quilts for shows this year. I listen to a lot of radio in the car. Recently I keep catching things about preparing, either for Brexit or the fall of civilization or maybe even the zombie apocalypse. I am far from convinced that this is needed, and somewhere between impressed and disgusted by some of the companies capitalizing on this. However there is a possible upside. Maybe if the disaster doesn’t appear on time people would consider donating their stashed food to food banks rather than letting it go off. I would guess that a food bank might have a better idea what to do with tins containing 40 servings of a meal than most families, especially in an emergency with a power outage. Now the question is, how can I spread the idea? I feel that I recognise this. It’s great to hear about what you are up to. Funny that Yes I think you do recognise it. It is fun, just hop in and out of projects atm.